You will be asked 20 questions. IF YOU GET A QUESTION WRONG, KEEP TRYING UNTIL YOU GET IT RIGHT. THE PROGRAM WILL ONLY CALCULATE YOUR SCORE IF YOU HAVE ANSWERED ALL THE QUESTIONS. Incorrect guesses will reduce your score. When you are finished, click "Submit" if you are satisfied with your score. Remember you need a score of at least 80% in order to get a "check" for this assignment. Note: As in English, the meanings of the prepositions in German are quite flexible, and very important to know, since these little words come up all the time. As a result, it is difficult to give English equivalents for a list like this. The compromise used below is to give their primary meanings, and to write "etc." where other meanings occur particularly often. Try the second of the "Practice Exercises" on this page (Wie sagt man...?) in order to get a feel for how these prepositions can be used in various contexts. von-zu." For the two-way prepositions, sing "An, auf, hin-ter, ne-ben, un-ter/?-ber, in, vor, zwi-i-schen" to the tune of the "An die Freude" ["Ode to Joy"] chorus from Beethoven's 9th symphony. often in informal spoken German, but are less common in writing. Other contractions (e.g. "neben + das = nebens") are possible, but only the more commonly used ones are listed below. durch (durch + das = durchs) through, by means of, etc. um (um + das = ums) around, at [time], etc. bei (bei + dem = beim) at, etc. von (von + dem = vom) from, etc. zu (zu + dem = zum; zu + der = zur) to, etc. an (an + das = ans; an + dem = am) at, to [vertical boundaries], etc. auf (auf + das = aufs) on, etc. in (in + das = ins; in + dem = im) in, to, into, etc. über (über + das = übers; über + dem = überm) over, above, about [topic], etc. unter (unter + das = unters; unter + dem = unterm) under, among, etc. vor (vor + das = vors; vor + dem = vorm) in front of, ago, etc. Nouns and pronouns following these prepositions will generally be in the Genitive in more formal speaking and writing, but are increasingly often in the Dative in less formal speaking and writing. Accusative, Dative, Two-Way or Genitive? This exercise just asks you to choose the appropriate case for each preposition. Wie sagt man...? This exercise will help you practice the range of meanings of the prepositions. Motion or Location? This exercise will help you decide whether sentences involving two-way prepositions describe motion or the location of the action. Wo/Wohin? Practice choosing the right preposition to say where you are and where you're going, and also practice using the appropriate cases with these prepositions. involve dative prepositions or accusative prepositions, for whom the motion/location distinction is irrelevant, and a couple of them involve prepositional verbs and adjectives. For more practice, please refer to the exercises on prepositions on the "Case Overview" page! Exercises involving prepositional verbs and adjectives. Was bedeutet...? Match the prepositional verbs with their English equivalents. Welche Präposition? Match the statements with the appropriate preposition. Lola und die Präpositionen If you've seen Lola rennt (Run Lola Run), try this to practice prepositions and prepositional verbs. Die große Liebe Practice prepositional adjectives by first matching the prepositional adjectives with their English equivalents, and then choosing the correct prepositions to complete a series of romantic statements. Reflexivverben mit Präpositionalobjekten Wir haben reflexive Verben noch nicht wiederholt, also [=thus] ist das eine Vorschau [=preview]. Wissen Sie, welche Präpositionen bei diese reflexiven Verben passen? accusative: MOTION--if the verb is describing a change of location: where someone or something is going or being put. Remember the above rule applies ONLY to the two-way prepositions. Nouns following dative prepositions will be dative even if motion is involved (e.g. "Sie geht zum [=zu dem] Arzt" and "Ich komme von der Ärztin"! ), and nouns following accusative prepositions will be accusative even if no motion is involved ("Ich singe ein Lied für dich"). verb whether it is followed by nouns or pronouns in the accusative or in the dative. Refer to the page on prepositional verbs for more information. Die Studenten sitzen in der Klasse. Location (where are the students sitting? In the class) ==> Dative. Die Studenten gehen in die Klasse. Motion (where are the students going? Into the class) ==> Accusative. Wir essen in der Mensa. Location (where are we eating? In the cafeteria) ==> Dative. Der Terminator kommt mit einem Maschinengewehr an meine Tür. Motion (The Terminator is coming to my door) ==> Accusative. Der Terminator steht mit einem Maschinengewehr an meiner Tür. Location (The Terminator is standing at my door) ==> Dative. Google sieht in unsere Herzen. Google (which is all-knowing) sees into our hearts ==> accusative. located inside our hearts (and there it is seeing some things), which we can only hope doesn't make sense. Google sieht die Liebe in unseren Herzen. Here the dative is appropriate: Google is seeing the love located in our hearts. ==> dative. Click here for more information on strong verb/weak verb pairs like stehen/stellen, liegen/legen, sitzen/setzen etc., which are frequently used with two-way prepositions. Ich lege es in den Kamin [=fireplace]. I put it into the fireplace ==> motion ==> accusative. Click here for more information on strong verb/weak verb pairs like stehen/stellen, liegen/legen, sitzen/setzen etc., which are frequently used with two-way prepositions. or away from the bed, the dative is used. Justin Bieber rennt vor das rasende [=speeding] Auto. The accusative "das ... Auto" means the action is taking JB in front of the speeding car, i.e. there is a speeding car, and JB is running out in front of it into its way ==> bad news for JB and the Beliebers. Justin Bieber rennt vor dem rasenden [=speeding] Auto. The dative "dem ... Auto" means the action is located in front of the speeding car, i.e. there is a speeding car, and JB is running along in front of it ==> if he is running fast enough, he will survive. where my swimming is taking place: in the sea. Ich schwimme ins Meer. By using the accusative I am emphasizing where I am swimming to: (out) into the sea. a. Normally, use nach for these. b. For countries with an article, use in. a. Use in if you will end up inside a place or location. b. Use auf if you will end up on something. Auf is also sometimes used for going to formal events or public places. c. Use an to describe motion to a precise spot, or to something that can be perceived as a horizontal or vertical boundary (something you would stand at or by in English). d. Use nach for directions (without an article), and idiomatically in nach Hause. Note: this, and the use of nach for going to cities, countries etc. described above, are the only uses of nach [to mean to]. Learners of German often use nach when they are not sure which preposition is correct, but zu is a much better guess--see (e) below! Fahren Sie nach links, nach rechts, nach Norden, nach Süden, nach Osten, nach Westen. Gehen Sie nach oben, nach unten. Ich gehe nach Hause. e. If in doubt, use zu! Zu can replace in if you need not emphasize that you are going inside, and must replace in if it would be absurd to speak of going inside--e.g. driving to a building, visiting a person. You also need to use zu if you're going to a particular company's locale that you're specifying with a proper name (e.g. Kroger). An exception to this latter rule is the huge department store chain "Kaufhof," the reason being that the name contains the word "Hof" [=yard], a space that one can go into. Zu can also replace the use of auf for formal events and public buildings, and it can replace the use of an generally. Thus, you can usually get by just by knowing zu, the use of nach and in for countries, cities etc. (and of nach for directions), and the use of auf for Straße, Land, Toilette etc.! Wo sind wir? : an, auf, bei, in, zu etc. 1. Use in, auf and an in the same ways as described under Wohin gehen wir? above; for exceptions, see (2) below. 2a .Nach is NEVER used for saying where you are. Use in for location in continents, countries with or without article, and cities. Use auf for location on an island. 2b. For location in public buildings, in (and occasionally an) is increasingly used instead of auf, especially in speaking. 2c. An is used quite generally to indicate location at or near a place; bei can also be used and is more like "in the vicinity of." 2d. Bei is used to indicate location in or at a particular person's or company's house/locale; it is also used to indicate one's place of work. If one is working or studying at an academic or otherwise "high-brow" institution, one uses an. e. Zu does not usually indicate location, but it used to. The most important remnant is zu Hause, and there are others, such as "zu Tisch" [=at table]. it: prepositions come up all the time, and are crucial in determining meaning! You can find more info on some of these prepositions in the "Superwörter" pages: um and nach in SW I; während and bei in SW II; zu in SW III; and unter and neben in SW V. Below are a few more reminders. 2a. The action is completed. Just put the time period in the accusative. Add lang, if you wish. Do NOT use für. 2b. The action began in the past and is continuing. Use seit + present tense. Do NOT use für. Stunde in Berlin. We have been (and still are) in Berlin for three weeks/one day/two years/one hour. 2c. The action extends into the future. Use für ONLY in this case. 3. Always use ohne for without/with no, never mit kein. Da ist ein Huhn ohne Kopf! There's a chicken with no head! Snoopy weigert sich, aus seiner Hundehütte zu kommen. Snoopy refuses to come out of his dog house. Er isst nicht mehr aus seiner Schüssel. He no longer eats out of his bowl. Snoopy kommt vom Mars, nicht aus Connecticut. Snoopy comes from Mars, not from Connecticut. Charlie Brown kommt von London, um zu helfen. Charlie Brown comes from London in order to help. Er gibt Snoopy einen Mantel aus Katzenfell. He gives Snoopy a coat made out of cat fur. Snoopy fängt aus Freude an zu tanzen. Snoopy begins to dance for [out of] joy. Die Peanuts Comics sind von Charles Schulz. The Peanuts cartoons are by Charles Schulz. Look him in the eyes! 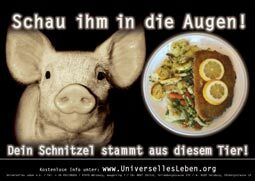 Your Schnitzel originates from this animal! 5. Wegen = because of. Unlike weil, da, and denn, wegen is a preposition, not a conjunction. Like because of, it is followed by a noun or pronoun (in the genitive, since it's a genitive preposition) that gives the reason, not by a whole clause (with a verb) that gives the reason. In speaking, it is often used with the dative instead of the genitive. Die Deutschstudenten sind vor der Klasse ganz aufgeregt. Die Deutschstudenten sind bevor der Klasse ganz aufgeregt. The German students are totally excited before class. Die Französischstudenten rennen schreiend weg, bevor die Klasse beginnt. Hochmut [=arrogance] kommt vor dem Fall. Hochmut [=arrogance] kommt bevor dem Fall. German counterpart of the English expression "Pride comes before the fall." Nachdem dem Essen sollst du ruhn, oder tausend Schritte tun. Literally, this means: "After the meal you should rest, or do 1000 steps." ==> After meals, take a nap or go for a walk. people to deal with later. gerade verpasst. Er ist vor zwei Minuten abgefahren. Der nächste Zug fährt morgen früh um 6:27." "When does the train to Hamburg leave?" -- "You just missed it. It left two minutes ago. The next train leaves tomorrow at 6:27." "Wann bist du aufgestanden?" -- "Vor fünf Minuten." "When did you get up?" -- "Five minutes ago." Eminem denkt, dass die Leute immer über ihn sprechen. Eminem thinks that people are always talking about him. Vom History Channel kann man viel über den 2. Weltkrieg lernen. One can learn a lot about the 2nd World War from the History Channel. 8. Nouns and pronouns following the most common genitive prepositions (an)statt, trotz, während and wegen will generally be in the Genitive in more formal speaking and writing, but are increasingly often in the Dative in more informal speaking and writing. in Spring and late Winter that gives people headaches and puts them in a bad mood. Meteorologically it is comparable to the Chinook in the Rockies.] Because of the Foehn wind, everyone was in a bad mood. waren die Straßen wir leergefegt. During the final of the soccer world cup the streets were deserted [wie leergefegt = as if they had been swept empty]. Trotz des Endes/dem Ende der Rezession stieg die Arbeitslosigkeit. Despite the end of the recession, unemployment increased. 9a. The dative preposition gegenüber can precede or follow the noun it refers to. When gegenüber is used with a pronoun, it must follow the pronoun. You should put the accusative preposition entlang after the noun it refers to. You may occasionally see it used before the noun, in which case it actually becomes a dative (or occasionally genitive) preposition. Das Panorama-Restaurant Loreley am Rhein liegt direkt gegenüber dem Loreleyfelsen. Das Panorama-Restaurant Loreley am Rhein liegt dem Loreleyfelsen direkt gegenüber. The Panorama-Restaurant Loreley am Rhein lies directly across from (opposite) the Loreley rock. Wenn man im Schiff den Rhein entlang fährt, sieht man viele romantische alte Burgen, und die sagenumwobene Loreley. [rare:] Wenn man im Schiff entlang dem Rhein/des Rheins fährt, sieht man viele omantische alte Burgen, und die sagenumwobene Loreley. If one rides along the Rhine by boat, one sees many romantic old castles, and the legendary Loreley. soccer. Click here for the RoboCup German Open.] The organizers of the Robo-Cup want to reduce the apprehensiveness [people feel] in relation to robots. Warum bist du mir gegenüber immer so aggressiv? immer so aggressiv? Why are you always so aggressive towards me?